Tumbledown isn’t a disappointment in many ways, it’s a disappointment in the same way on repeat. Basically, every piece of the film has been done better elsewhere and every actor in the movie has given us better in another role. It’s 95 minutes of recycled material and second level performances, not something that’s bad enough to turn off, but definitely not something that’s good enough to recommend. Director Sean Mewshaw makes his feature-length debut, and in order to pull it off, borrows heavily from literally anything else. He might have been saved had his cast produced a few original moments, but they seemed to be focused elsewhere, phoning it in for these roles, as if they already knew that it wasn’t exactly worth their time. Hannah’s husband was an up-and-coming folk musician, a poet with an enormous amount to say and the perfect voice with which to say it. After one album and the beginning of a promising career, he died in the mountains of Maine after a freak accident, leaving Hannah behind to pick up the pieces and to play caretaker to a grave that would become a shrine. Tired of people trying to make a buck off of her husband’s legend, she at first scorns professor/author Andrew as just another music junkie or wannabe celebrity. But she soon discovers that Andrew means to give her husband an immortality that she can’t quite muster on her own, and that moving on after the death of a loved one doesn’t have to be an omission of their memory. I like these actors, I liked the sad story, and I was prepared to like this film as a whole, but I’ve seen better many times over, and so Tumbledown just doesn’t hold up. Rebecca Hall is masterful in Christine; watch her there instead. 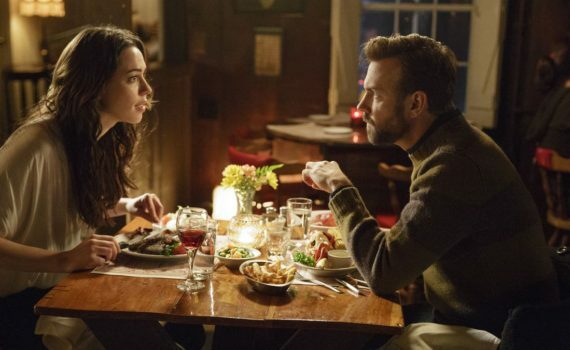 Jason Sudeikis is a rom/com god in Sleeping with Other People; check that one out with your boyfriend. Rudderless is a phenomenal film about music & loss; this film just doesn’t compare. My point is, you can get these qualities elsewhere, and you probably should, since they’ve produced before this, and produced better. From the plot foundation to the side characters, it’s all something we’ve seen before; it’s not bad, it’s just not special. And the leads have absolutely no chemistry, which is upsetting, because they are both talented, both capable, but they just didn’t bring it here. Tumbledown isn’t awful, it just isn’t new, and you’re better served seeking entertainment elsewhere.